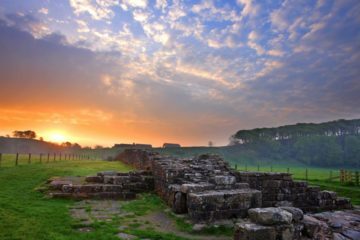 The Western Section of Hadrian’s Wall begins at the Poltross Burn Milecastle in Gilsland. 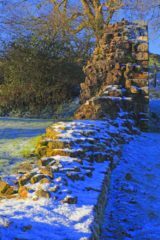 Following the Hadrian’s Wall National Trail takes you to Willowford and the ruins of the Roman Bridge across the River Irthing. 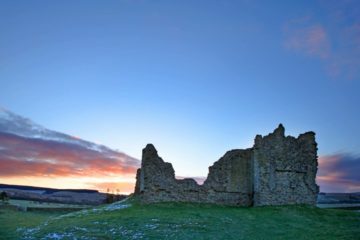 High above the river is the Roman Fort of Birdoswald where excavations clearly show the design of the fort. Travelling west the landscape changes to archetypal English pastoral scenery. 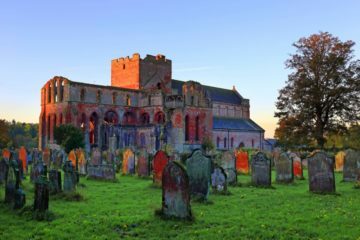 Just to the south of the Hadrian’s Wall National Trail is the magnificent red sandstone ancient Lanercost Priory, the eastern part of which is a photogenic ruin. 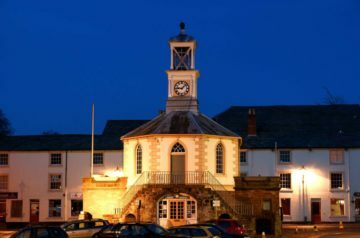 The road by the Priory takes you to the picturesque small town of Brampton with its Market Square and unusual octagonal Moot Hall. 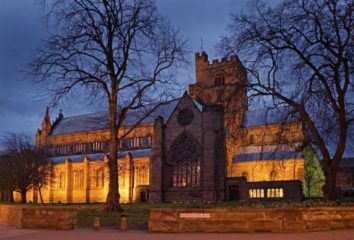 The next major feature is the historic city of Carlisle with its very attractive centre. 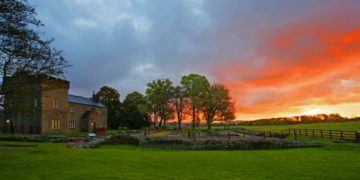 Places of interest include the impressive Castle and Tullie House Museum. 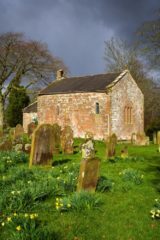 As we move forever west the countryside features an abrupt change to the salt marshes of the Solway Firth and eventually the Irish Sea. 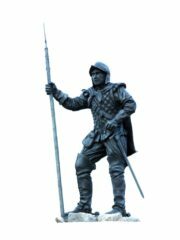 Set alone on the marshes is the King Edward I monument with its backdrop of the marches and the distant Scottish hill Criffel and there is a magnificent statue of the King by the pub in the nearby village of Burgh By Sands. As we near the final destination of the east-west walk we pass through Port Carlisle with the long defunct canal to transport cargo from ocean going vessels to Carlisle city centre many miles away. The canal was replaced in 1854 with a railway line built on top of it – that is also now defunct. 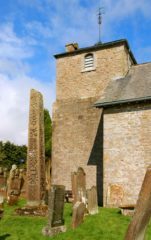 Finally – Bowness on Solway, the end of our journey. Bowness is a delightful little village. If you are lucky in between the end of February and early September you may see the still practiced Viking form of fishing called “Haaf Netting”. This is only placed it is permitted in the UK. 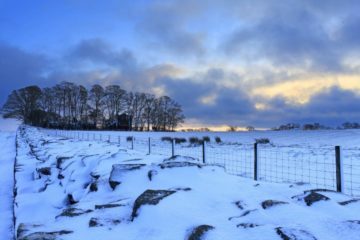 The Hadrian's Wall Path at Steel Rigg in Northumberland at sunrise on a winter morning before it turns sharply don towards the bottom of Peel Crags. 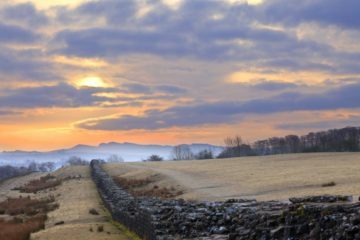 At Birdoswald Roman Fort on Hadrian's Wall in Cumbria there is the longest continuous stretch of the Wall. The sheep mothers are reminding their lambs that you are asked not to climb on the Wall. 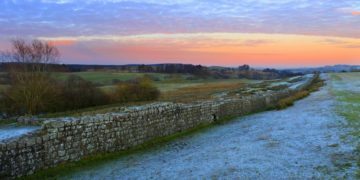 Hadrian's Wall at Birdoswald Roman Fort in Cumbria early on an Autumn morning. 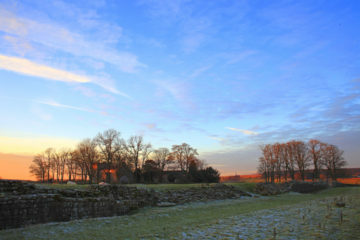 The Wall adjoining Birdoswald on both sides of the fort constitutes the longest stretch of wall. 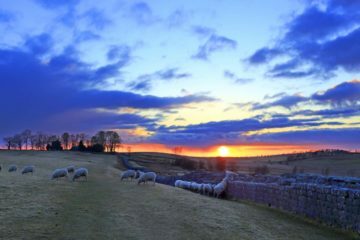 The boundary wall of the Roman Fort on Hadrian's Wall at Birdoswald in Cumbria. 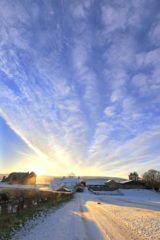 The low, late winter sun illuminates the farmhouse. 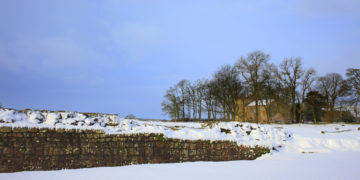 The boundary wall of the Roman Fort on Hadrian's Wall at Birdoswald in Cumbria on a snowy winter day. 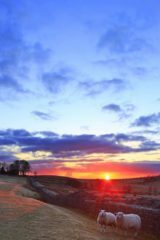 A colourful Autumn dawn behind Birdoswald Roman Fort on Hadrian's Wall in Cumbria. 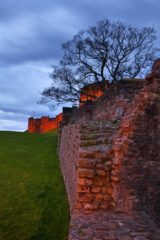 The crags of the middle section of the Wall have gone but on the southern edge of the fort there is a precipitous drop to the River Irthing. 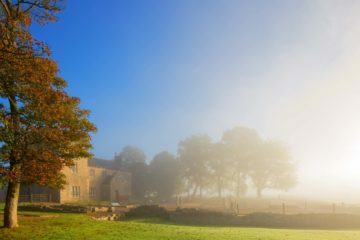 A beautiful misty autumn morning at the farmhouse at Birdoswald Roman Fort on Hadrian's Wall in Northumberland. 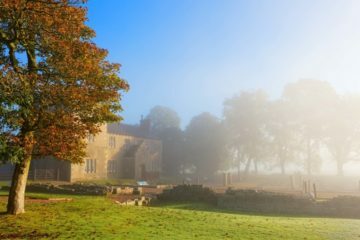 Birdoswald is the main visitor centre in Cumbria. 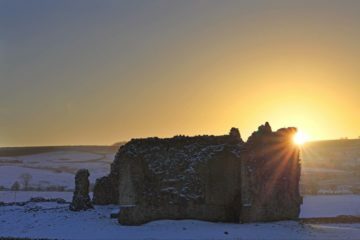 The dawn clouds disperse over Birdoswald Roman Fort on Hadrian's Wall in Cumbria after a light snowfall. 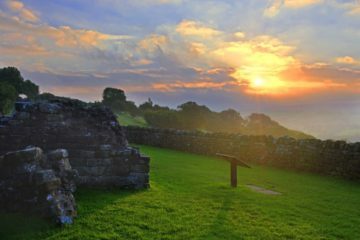 Banks East Turret on Hadrian's Wall in Cumbria on an autumn morning. 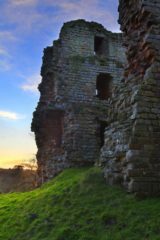 The turret is adjacent to a small car park with a great view over the course of the River Irthing and on to the Cumbrian North Pennines. 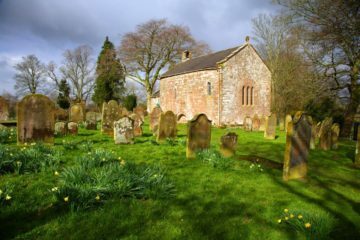 Just past the picturesque village of Banks in Cumbria heading west the Hadrian's Wall Path passes a small section of the Roman Wall at Hare Hill. 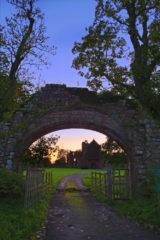 A glorious autumn sunrise looking through the old archway at the entrance to Lanercost Priory just south of the Hadrian's Wall Path near Brampton in Cumbria. 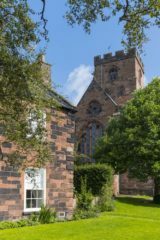 The area around Carlisle Cathedral is charming and historic with the characteristic red sandstone buildings. 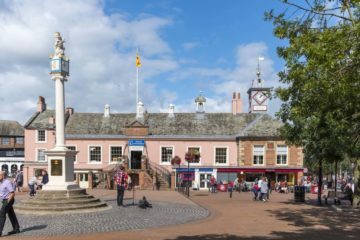 For long periods Carlisle was a border stronghold and home to the infamous Armstrong Border Riever name. 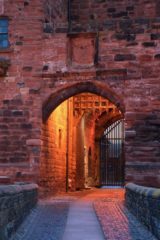 Carlisle has a long history as a border city in Roman Times and as an Armstrong stronghold in the era of the Border Reivers. It is now a beautiful city and regional centre. 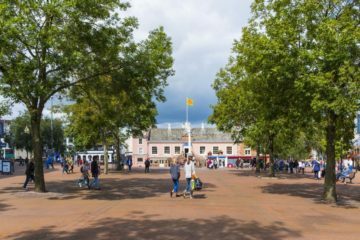 Carlisle City Centre is open, spacious and restful. 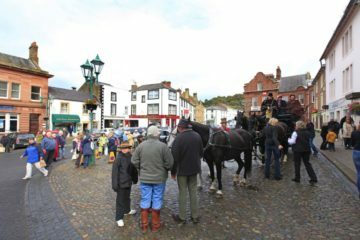 The city has good shopping and an abundance of historic buildings and the excellent Tullie House Museum. In Scotland Road in Carlisle in Cumbria is a fabulous statue of a Border Riever. The Border Rievers were expert horsemen who ruled the Border Country for three centuries with violence, blackmail, extortion and rustling - and that was only some of it! 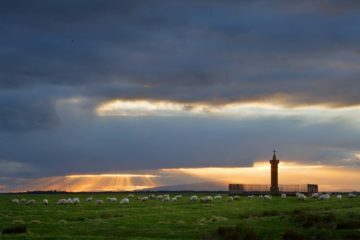 A short walk from the Hadrian's Wall Trail at Burgh-by-Sands on the Solway Firth marshes in Cumbria is the monument on the spot where the notorious King Edward I died. 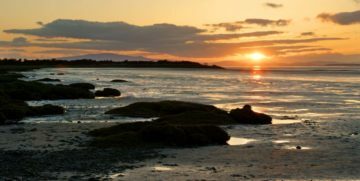 Perhaps it is appropriate that the end of the Hadrian's Wall Path for many ends with a sunset at Bowness on Solway on the Solway Firth in Cumbria.